In 1994 sections of fence were built along 580 miles of the 1,989 mile border separating the United States from Mexico. During the 2016 Presidential Election, Donald Trump fired up his base of supporters by promising to build one continuous wall along the border at an estimated cost of $8 billion to $12 billion. Yet, critics claim that the price tag is more likely to range from $15 billion to $25 billion. Let's put the multi-billion dollar price tag aside. I'd rather focus on what such a wall would make us look like to the rest of the world. It would literally put us in the same category as East Germany. For those of you who were born after the early nineties, after World War II Germany was divided into the East and West. East Germany was part of the Communist Block and West Germany, eventually, became a member of NATO. Because Berlin was the capital of Germany, the city was divided right down the middle. In order to keep their own people in, and everybody else out, in 1961 East Germany built a wall, complete with armed guards. 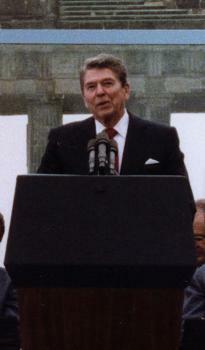 Subject: Ronald Reagan speaking in front of the Brandenburg Gate and the Berlin Wall on June 12, 1987 | Photographer: White House Photographic Office |As a work of the U.S. federal government, the image is in the public domain. The wall became synonymous with oppression around the world. On June 12, 1987, Republican president Ronald Reagan famously railed, "Mr. Gorbachev, tear down this wall!" The very concept of the wall was seen as a representation of everything America was against. On November 9th, 1989,we celebrated as a country when the wall came down. Fast forward to 2018, and Donald Trump is threatening a government shutdown if congress won't approve the wall on the Mexican/American border. He wants to spend billions of dollars to recreate what was once a symbol of communism. Keep in mind, he doesn't want to embrace the good parts of communism such as, universal health care and free access to higher education. He rejects those parts, but he glorifies dictators; such as Vladimir Putin and Muhammad bin Salman; he's parked thousands of military troops along our southern borders, and he wants to build a wall. Of course, he's not entirely to blame. When he ran for office he told voters he wanted to build a wall and it wasn't a deal breaker. Think about that for a minute. People voted for him knowing he wanted to build this thing. He knew enough people were scared of immigrants that he would be able to play on those people's fear to get elected. He's still doing it! For the last month the president has been pointing to a caravan of asylum seekers to justify his plan for a wall. He's equated desperate people fleeing from violence and oppression with an invasion force. Trump claims the caravan is filled with members of Al Qaeda trying to invade the United States Of America. People from South America have nothing to do with Al Qaeda. Yet, he can get a way with such an equation, because he knows there are enough white Americans, who put lump all brown skin people in one category, to fall for it. He knows how to use fear to manipulate the masses. If we want a country fueled by ethics, rather than fear, its up to us to say, "ENOUGH!" Mr. Trump forgo this wall!